Just another week left of the grand line-up of the naked-eye planets in our pre-dawn sky. After that Mercury will probably be a bit too low for us to see it low in the east shortly before sunrise. Tomorrow morning before sunrise you'll see from lower left to upper right: Mercury and super-bright Venus in Sagittarius low in the east, yellow-white Saturn in between Scorpius and Ophiuchus, orange-red Mars in Libra, and super-bright Jupiter in between Leo and Virgo in the south. The attached chart shows the first four planets. The line-up spans too much of the sky to get it all to fit on a square chart. A line-up like this with all of the naked-eye planets doesn't occur that often. The last time we saw all five of them in the sky at once was over a decade ago in mid-December 2004 to mid-January 2005. We'll have another chance to see all of them in the sky at once for a few evenings in August of this year but Mercury and Venus may be a bit too low for us to see them in our hazy evening twilight skies. 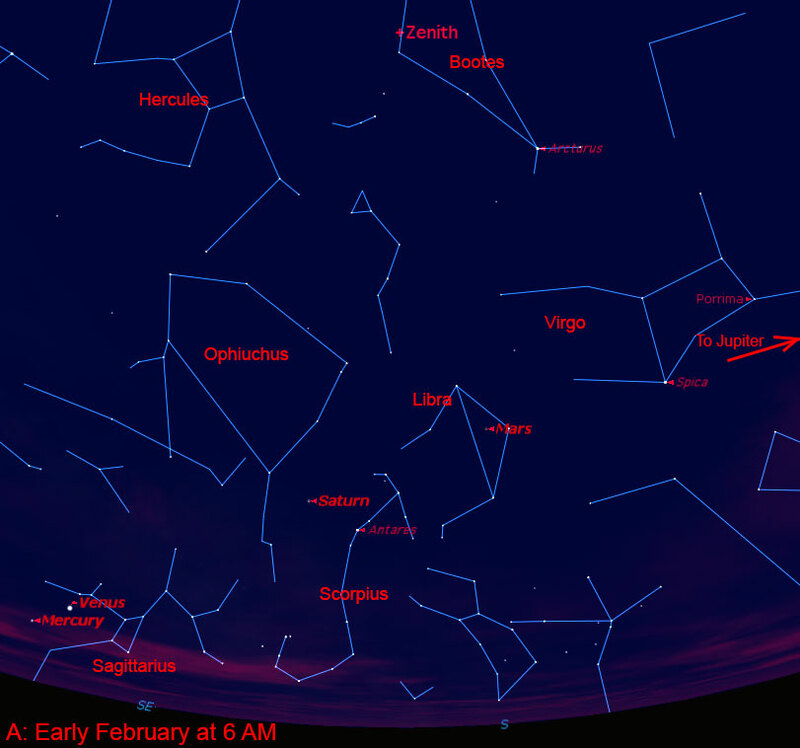 This week's view before sunrise will be much easier to catch all five of the planets. The line-up across the sky also enables you to trace out the ecliptic arc across the sky. A couple of bright stars also help to trace out the arc: Spica in Virgo between Jupiter and Mars and to the right of Jupiter, Regulus in Leo. The ecliptic is the path that the Sun appears to move along against the starry background throughout the year. Of course, we now know that it is Earth that moves around the Sun, so the ecliptic is the plane of the Earth's orbit around the Sun. The fact that all of the planets stay pretty close to the ecliptic tells us that the main part of our solar system is pretty flat with all of the planet orbits closely aligned to each other. This is because the Sun and planets formed from a spinning flat disk of gas and dust 4.6 billion years ago. So what about that ninth planet that might exist well beyond the orbit of Pluto? The orbits of two groups of Kuiper Belt - scattered disk objects can be explained well by the gravity from a large planet tilted by about 30 degrees with respect to the ecliptic plane (the plane of the inner solar system). Two scientists, Konstantin Batygin and Mike Brown, from California Institute of Technology two hours south of us in Pasadena released their results to the public a couple of weeks ago. Although no planet has been detected yet, Batygin and Brown make a strong enough case to warrant a search for it. I talked about the possibility of a large planet in our solar system beyond the orbit of Pluto way back in April 2014 when the object 2012 VP113 was in the news. The case back then for a large planet way out there wasn't as strong as the recent announcement and I was, let's say, "a bit skeptical" of the claim. Now it doesn't seem so outlandish. The two researchers spent a year and half trying to prove themselves wrong and did some heavy-duty computer calculations to come up with possible orbits and planet masses that could explain the orbits of the Kuiper Belt objects. What makes their case even stronger is that their computer model made a prediction about the existence of another class of Kuiper Belt objects that they hadn't thought of before. Lo and behold, this predicted third class of objects with orbits perpendicular to the ecliptic was found. Batygin's and Brown's paper in the Astronomical Journal has undergone a rigorous peer review process needed for legitimate science to make sure we don't fool ourselves. That peer review process has said that there is a good argument for a planet with about ten times the mass of Earth in an orbit, an average distance of about 700 times that of the Earth (about 23 times that of Neptune's orbit), and an orbit eccentricity of about 0.6. Good enough argument for it that it is worth re-arranging observing times on the largest telescopes to go hunting for it. At closest approach to the Sun, Planet Nine would be about 26 billion miles from the Sun—close enough that it could be detected with the largest amateur telescopes. However, it is more likely that is close to the aphelion distance of about 104 billion miles from the Sun, so a large research-grade telescope will be needed to spot it. If Planet Nine's average distance is 700 times that of the Earth, it would take about 18,500 years to complete one orbit but because there is a range of possible orbits that fit the data, Batygin and Brown have quoted an orbit time of "somewhere between 10,000 and 20,000 years". Either way, it takes a long, long time to orbit the Sun. Brown's best guess is that Planet Nine is in the direction of the sky that is directly overhead in late November around Thanksgiving at midnight. A planet with mass of ten times the Earth is large enough for us to wonder if it should be called a "mini-Neptune" instead of a "super-Earth", where those terms are used to describe only their masses or diameters. Compared to the nearly 2000 other confirmed exoplanets discovered so far, our solar system seems a bit odd in not having a planet that is between the Earth and Neptune in size. Planets that size are quite common in the galaxy. It is possible that our inner solar system used to have a planet that size but through gravitational interactions with the larger planets, it got gravitationally slingshot to its present orbit. Much closer to home dwarf planet Pluto continues to surprise us as data streams back to us from the New Horizons spacecraft months after the July 2015 fly-by. Water ice is Pluto's bedrock on which other types of ices, such as methane, nitrogen, and carbon monoxide, come and go. The latest maps show that the exposed water ice is much more widespread than expected. The dwarf planet in our neck of the woods, Ceres, is now under even closer scrutiny as the Dawn spacecraft has settled into it final, closest mapping orbit. In other space exploration news, the Japanese space agency, JAXA should launch the Astro-H X-ray observatory next week. Astro-H will observe the X-ray universe, studying objects such as supernova explosions, supermassive black holes, distribution of dark matter in galaxy clusters, and large-scale structure of the universe (superclusters). One final thing to put on your calendar is February 19th when tickets for the "Supervolcanoes" show go on sale. "Supervolcanoes" will be shown on March 3rd.